"Expert Levels" redirects here. For information about the Expert Levels in Mario vs. Donkey Kong, see Mario vs. Donkey Kong#Expert Levels. Secret Storage is a special bonus attraction and the last attraction in Mario vs. Donkey Kong: Mini-Land Mayhem! It takes place in the amusement park storage, depositing piles of barrels, ladders, a toy box and a large pipe. 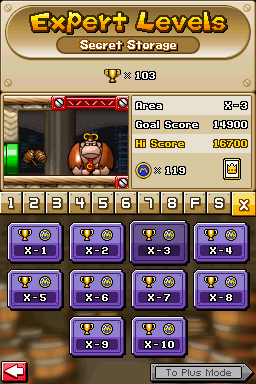 The player must collect a certain amount of trophies to unlock new levels in this attraction. However, the attraction itself becomes available after defeating Donkey Kong in Final Ferris Wheel. The levels of Secret Storage are more difficult and intricate than the main levels, representing a final challenge the player can face. There are ten levels in both the Normal and Plus Modes. Enemies here include Circus Kongs, Shy Guys, Fire Piranha Plants, Thwomps and Snifits. Common objects here are Conveyors, Springs, Blue Ladders and Warp Pipes. This page was last edited on November 13, 2018, at 23:36.